We were able to get a lot of things done this past week. Monday, my sister took her daughters, my two junior bridesmaids, to get their dresses. I was able to meet up with them and give my input on styles and such. They are going to be so lovely, I can’t wait to see them when the dresses are altered and they have their hair done up. After we left the dress shop, I stopped at Hobby Lobby to see what kind of stands they had for Unity Candles. Let me tell you, they were just pitiful. There was nothing really beautiful. I’ve got a more earthy turn and the ones they had were either glass with gem embellishments or metal with big random hearts all over. Definitely not my style at all. I shared my dismay with Matt who immediately began searching online for one that would be a better fit. He found something so suited to what I wanted, it was fabulous. I ordered a set and it should be here by the beginning of May! I don’t want to share it, but here is the shop on Etsy. She has some other lovely things. Matt and I both had Thursday off and so decided to spend the day getting some other shopping done together. The plan was to find his clothes for the wedding (I’m fairly taken care of) and then find some cheap rings for the ceremony. 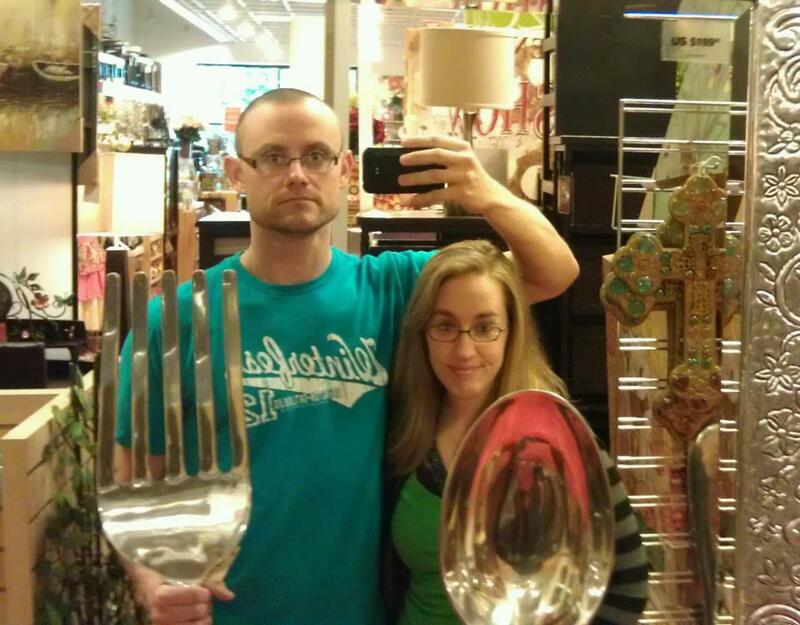 We went to JCPenney for the clothes and found just about everything we needed! Our bridal party are wearing/alternating of sorts, the wedding colors, and the thought was that to make Matt stand out more, we would have him all in red and then tan khakis. We easily found a red bow tie, but could not find a good fitting red shirt to match. So, Matt decided he’d rather stand out more by wearing a white shirt with the red accents. There’s nothing more frustrating than looking at wedding pictures and not being able to tell the groom apart from the rest of the guys. This would’ve been a problem because the best man (Matt’s brother Adam) would’ve been dressed almost the same as Matt. This will definitely keep him distinguishable. Did you know that suspenders are hard to find? I didn’t think they would be, what with the hipster culture going on right now. We are not hipster, but you plan on things being easy to find and when they aren’t, that’s frustrating. So, I went to my default problem-solving website to find what I needed. And, voila! Etsy pulled through again. Albeit, a little more pricey (more than half what the rest of Matt’s outfit cost!! ), but I found what I was looking for. The shop owner is currently on vacation until the end of April, probably sewing up Matt’s suspenders! 😀 I can’t wait to see them in person. I hope they look as wonderful as I think they will. We finished up with the clothes and on a whim, stopped by the jewelry selection. We found just what we were looking for, probably cheaper than we could’ve found elsewhere too! It took some convincing, but we finally got the lady to understand that we weren’t looking for anything spectacular. See, Matt’s job requires him to be jewelry-free, including wedding bands. He needs something he can easily take off and put back on. He also needs something that isn’t so expensive that if he loses it, we’re devastated financially. We are willing to pay for certain aspects of this wedding, but other parts are just not a big deal to us. 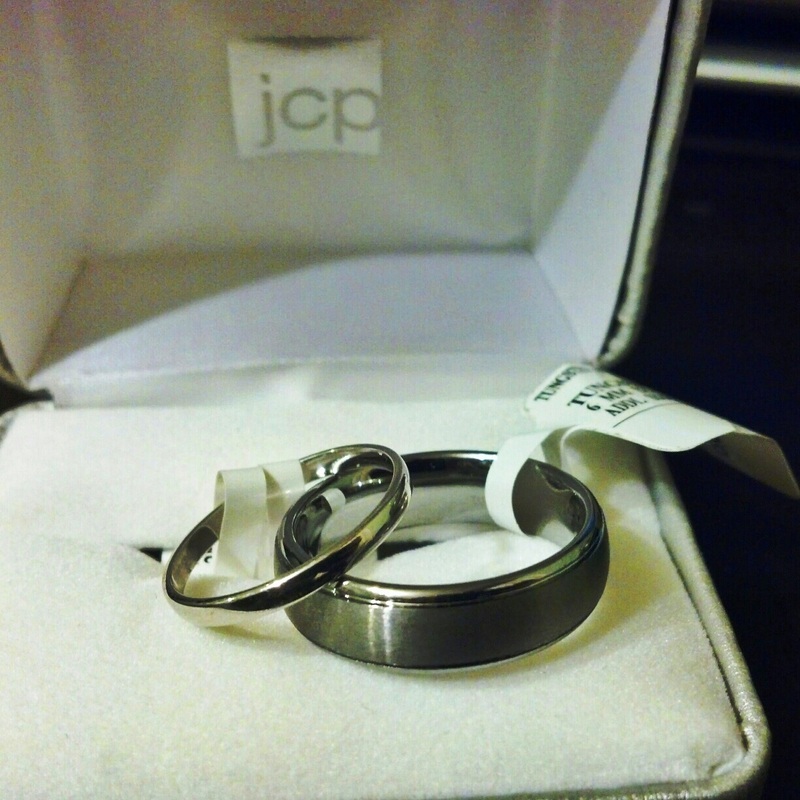 For me, we found a simple, narrow sterling silver band that will sit beautiful next to my white gold engagement ring. Maybe for our anniversary, we’ll spring for the matching band to my engagement ring, but it’s not essential. We just need something for the wedding. What we found cost us just over $75 together! I like that kind of spending. Might not be valuable to the world, but they’re precious to us! While I’ve got you, I’ll let you in on a secret. I was at Target and found this lovely little glass pitcher, the kind with a spigot on the bottom for easy dispensing. It is very sweet. I wanted to add it to our registry, but I didn’t have time to go all the way back to the counter to get a scanner gun configured and go back to scan it and then leave again. It would’ve been a pain. But recently, I added the Target app to my Android. I signed in to my registry on my phone and found this handy-dandy bar code icon at the top of the screen. I touched it and amazingly, I could scan the barcode of the pitcher through my camera. In just a few moments, the pitcher was now on our registry! Remarkable! I was so excited that, had I had more time, I might have run around the store to add some more things on it, but I’m so glad to know that I can do this in the future. You can also manage your registry from there (increasing item counts and such. It’s a great tool. The only thing I couldn’t do was remove an item, but when I got to a computer, I could do that. Anyway, take that knowledge and go with it, m’dears! Oh, and remember that you have to scan the barcode on the actual item, not the one on the shelf with the price. Why they can’t work that out to be the same, I don’t know, but it’s ok. We still love them. This entry was posted in Getting Married and tagged Engagement ring, Etsy, etsy shops, Etsy wedding, Getting Married, J. C. Penney, Relationships, Target app, Target registry, Unity Candle, wedding, wedding bands, wedding clothes, wedding jewelry. Bookmark the permalink.